Stronger and Efficient make your garden watering life easy and convenient. We upgraded our hose to highest quality for best user experience. 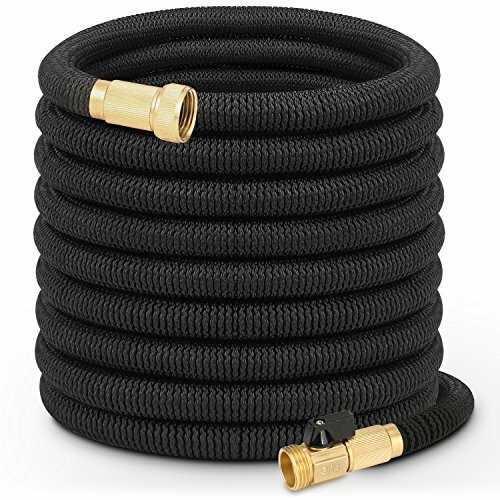 ☘️ LIGHTWEIGHT AND FLEXIBILITY: The expandable hose is lightweight. The original lenth is 33 feet. It can be expanded up to 3 times of its original length with water pressure, then retracts when the water is turned off. Never kink and tangle. Lightweight, compact and storage easy. ☘️ HIGH QUALITY AND DURABLE : GROWFAST garden hose 100% durable layer latex core and 5000*5000D high strength tough outer weave that made. ☘️ BRASS FITTING CONNECTOR WITH ON/OFF VALVE- The copper fittings have been considered the premium choice for durability and longevity of high pressure fitting. It perfectly solves the leak problems of plastic connectors, seldom crack or slip with solid 3/4" brass connectors and inner rubber washer. With the on/off valve on it, it's easy for you to shut the water without turning off the tap. ☘️ WIDELY USED -For gardening, floor cleaning, pool cleaning outside window cleaning, car washing, pet shower, and so on. ☘️ EASY TO STORE - lightweight, highly portable, flexible hose comes with a free storage bag - simple way to save your storage space. ATTTENTION： As with all of these types of hoses, one needs to be careful. It can not suffer such a long time expose to the sun. Please dry the hose fabric in ventilated place and then put it into the pouch. Stored it in the shade when not in use. If you have any questions about this product by growfast, contact us by completing and submitting the form below. If you are looking for a specif part number, please include it with your message.